by Gary Bauer, Contributing Author: I love Thanksgiving -- a uniquely American holiday. It's not just a day off work, a day devoted to parades and football, not even to turkeys and pumpkin pies. As the name makes clear, it is about giving thanks to God for the blessings we enjoy. 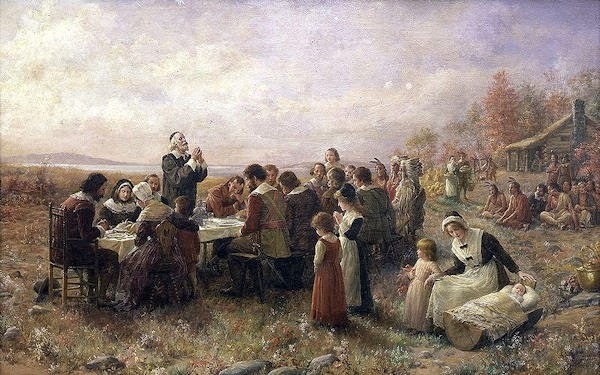 Thanksgiving traces its origins back to the Pilgrims -- those hardy pioneers who arrived on the shores of North America and, against all odds, carved a nation out of the wilderness. They came to the New World not seeking fortune, but freedom. Specifically, the freedom to worship God as they wished. Thanking God for His blessings was a routine experience in our early years. The first official National Proclamation of Thanksgiving was issued by the Continental Congress on November 1, 1777 in celebration for the victory against the British at the Battle of Saratoga. In October of 1863, Abraham Lincoln issued a formal proclamation calling on the country to observe the last Thursday of November "as a day of Thanksgiving and Praise to our beneficent Father who dwelleth in the Heavens." And as America confronted a world at war in 1941, Congress voted to establish Thanksgiving as a national holiday. In his first Thanksgiving proclamation, President Ronald Reagan wrote:"America has much for which to be thankful. The unequaled freedom enjoyed by our citizens has provided a harvest of plenty to this Nation throughout its history. In keeping with America's heritage, one day each year is set aside for giving thanks to God for all of His blessings. . . .
"As we celebrate Thanksgiving . . . we should reflect on the full meaning of this day as we enjoy the fellowship that is so much a part of the holiday festivities. Searching our hearts, we should ask what we can do as individuals to demonstrate our gratitude to God for all He has done. Such reflection can only add to the significance of this precious day of remembrance. "Let us recommit ourselves to that devotion to God and family that has played such an important role in making this a great Nation, and which will be needed as a source of strength if we are to remain a great people. In spite of the personal and national challenges we face today, I believe all of us can be thankful to be Americans. We are the descendants of the patriots who declared that "All men are created equal and endowed by their Creator with certain unalienable rights, that among these are life, liberty and the pursuit of happiness. "Tomorrow, when Carol and I celebrate Thanksgiving with our family, we will give thanks for America, for our men and women in uniform and for you. We wish each of you all of God's blessings at this special time of year. Tags: Be Thankful, Thanksgiving, Gary Bauer, Campaign for Working Families To share or post to your site, click on "Post Link". Please mention / link to the ARRA News Service. and "Like" Facebook Page - Thanks!